Israel's Prime Minister Ehud Olmert (L) shakes hands with his Turkish counterpart Tayyip Erdogan at the Elysee Palace July 13, 2008, in this picture released by the Israeli Government Press Office (Avi Ohayon/Reuters). The recent announcement that Israel and Turkey are restoring full diplomatic relations is unlikely to signal the dawn of a new day in Israeli-Turkish relations. Many thanks to Brad Rothschild for his help with the Hebrew. News came over the weekend that Israel and Turkey are making up. There have been on and off rumors to this effect over the last three or four years, but the expected rapprochement never came. There was some hope that Jerusalem and Ankara would patch things up quickly after President Barack Obama visited Israel in March 2013, and as a party favor—a “deliverable,” as it is known in the awful jargon of Washington wonkery—Prime Minister Benjamin Netanyahu called Recep Tayyip Erdogan, who was Turkey’s prime minister at the time before ascending to the presidency in August 2014, to apologize for the infamous 2010 Mavi Marmara incident. It was not to be, however. Negotiations dragged on with varying degrees of intensity between Turkish and Israeli diplomats in the ensuing years with episodic rumors and press report of imminent breakthroughs. Yet because the foreign ministries in both countries actually have limited influence on foreign policy, it was up to the leaders, and neither Netanyahu nor Erdogan seemed all that interested in a rapprochement. All that said, today’s official announcement that Israel and Turkey are restoring full diplomatic relations was not that much of a surprise. But as important a development as the deal may be, this is unlikely to be the dawn of a new day in Israeli-Turkish relations. Before getting into why there is a deal now, but not one or two years ago, it is important to review just how Israel and Turkey—who were close strategic partners for a brief moment in the late 1990s and early 2000s—got to this place. The Mavi Marmara incident in which a Turkish-owned ferry sought to run Israel’s naval blockade of the Gaza Strip, killing eight Turks and a Turkish-American in the process, is often cited as the denouement. It was certainly a low, but the crisis began a few years earlier in December 2008. Few remember this, but in the late 2000s then Prime Minister Erdogan and his foreign minister at the time, Ahmet Davutoglu, were overseeing indirect negotiations between the Israeli and Syrian governments. The culmination of these efforts came in late December 2008 when Erdogan hosted Israeli Prime Minister Ehud Olmert at his Ankara residence while simultaneously holding a phone call with the Syrian leader, Bashar al-Assad. According to accounts of the evening, Erdogan engaged in mini–shuttle diplomacy, working the phone in one room, asking Assad to hold the line, then moving to another room to talk to Olmert, all in an effort to convince the two adversaries to begin direct negotiations. Erdogan failed, and Olmert, a few days after returning to Jerusalem, launched Operation Cast Lead in response to Palestinian rocket fire into in Israel from Gaza. The hostilities lasted for three weeks. Anywhere between a thousand and 1,400 Palestinians were killed, and thirteen Israelis lost their lives. Erdogan was mortified. Olmert never told him that a military operation was imminent, and coming so soon after the Israeli prime minister’s visit to Ankara it looked like either Erdogan was complicit in Israel’s invasion or too weak to stop it. The Israelis were justified taking the fight to Gaza after Hamas had fired nonstop rocket attacks, but Olmert—who is now serving time in prison for corruption—failed to appreciate the strategic environment in which he was operating. Had he been more astute at that moment, he might have asked Erdogan for help in Gaza. 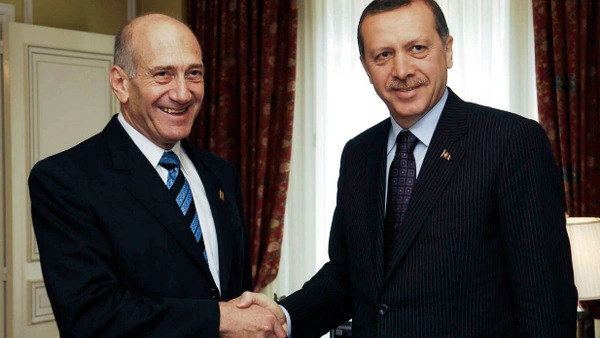 It is true that Israelis trusted Erdogan on Syria in ways they never trusted him on the Palestinian issue, but Olmert might have been wise to play to Erdogan’s vanity and ask him to use his good relations with Hamas to try to cut out the rockets. If Erdogan succeeded, there would not have been a need for military operations in Gaza and the crisis in Israel-Turkey relations might have been avoided or at least delayed. Had the Turkish prime minister failed and Olmert was force to order up Cast Lead, at least he could claim that he tried every avenue, even asking Erdogan, Hamas’s emerging patron, to intervene. A long shot to be sure, but one that seemed worth taking. Almost everything after Cast Lead was all Turkish bile. It seemed that Erdogan and his Justice and Development Party (AKP) derived a certain amount of domestic political benefit from the anti-Israel and anti-Jewish sentiments they whipped up. For a time, Erdogan hit the Israelis at every ribbon-cutting event he attended. It seemed to be a reflection of a weird obsession with Jews, which makes sense since Erdogan and his party come from the Millî Görüş, or National View, movement, which has long harbored animosity toward Israel, Israelis, and Jews generally. There are three reasons why the Turks wanted the deal now more than ever. First, the Israelis have a lot of natural gas and Cyprus has a lot of natural gas. There have been signals all year that negotiations to find a solution to the Cyprus problem and reunify the island are promising. It seems that the deal with Israel is connected to the coming gas bonanza in the Eastern Mediterranean. Second, Ankara’s approach to the Middle East has been an utter failure. Its bid to lead the Middle East after the Arab uprisings was based more on the self-reinforcing myths that AKP elites told themselves than their actual ability to drive events in the region. There was also little chance that Saudis, Egyptians, and Emiratis were going to allow the Turks to play the role they sought. Between the summer of 2013 and rather recently, Ankara had bad relations with Riyadh, Abu Dhabi, Cairo, Jerusalem, and Baghdad—in other words, all the major capitals in the region. When Erdogan forced Davutoglu from the prime ministry on May 5, Davutoglu could be made the fall guy for Turkey’s regional isolation with few, if any, political consequences for the president. This is not entirely a stretch; Davutoglu was the architect of Turkey’s grandiose ambitions in the Middle East as an advisor and then foreign minister during the last five years of Erdogan’s tenure as prime minister. Then again, it is not like Erdogan did not embrace the idea of Turkey’s (and thus his own) leadership of the Middle East. The third reason is Syria. This is the failure within the failure of Ankara’s entire bid for leadership in the region. That the uprisings-turned-civil-war-turned-proxy-war has created a zone of jihadi violence and an area of great power competition that has consumed Syria and obscene numbers of Syrians is an extraordinarily difficult problem. No country, including the United States, has managed to handle it well. The Turks should get credit for doing their best to manage the massive inflow of refugees, now numbering almost three million. Beyond that, Ankara’s Syria policy stands out for one bone-headed move after the other. Where to begin? They believed they could convince Assad to reform early on in the crisis, they thought Ankara could coordinate and lead the Syrian opposition, they turned a blind eye to jihadis using Turkey to take part in the fight against Assad before actually coordinating with extremist groups, they were reluctant to allow members of the anti–Islamic State coalition to use Turkey’s airbases, they shot down a Russian bomber, and they failed to see how their unwillingness to join the fight against the self-declared Islamic State in order to snuff out Kurdish nationalism actually helped make Ankara’s Kurdish nightmares come true. Of all these issues, the Kurds are driving Turkey back to Israel. The Israelis have long sought to maintain close ties with non-Arab groups and countries in the Middle East to mitigate Jerusalem’s regional isolation. This was the logic behind Israel’s ties with Turkey. The Israelis have long supported Kurdish independence in Iraq, an issue that used to be deeply disconcerting for Ankara, but not as much anymore given the close ties between the AKP and Masoud Barzani, the president of the Kurdistan Regional Government. Now with the emergence of the Federation of Northern Syria—also known as Rojava, or Western Kurdistan—along a strip of territory running from the district of Afrin that borders Turkey’s Hatay province in the west to the border with the Turkish town of Cizre in the east, the Turks find themselves in trouble. Syria’s Kurds do not control all of that territory yet, pockets of which are dominated by rebel forces, regime forces, or the Islamic State, but it is only a matter of time. The Turks want to forestall any Israeli mucking about in the area and any declaration of support for Syrian Kurdish independence aspirations so they have decided to patch things up with Jerusalem. More importantly, the Turks seem to believe that by letting bygones be bygones with the Israelis they will get a better hearing on their concerns about Syria’s Kurds from Rojava’s accidental patron, the United States. In the American effort to turn back the Islamic State, Washington went looking for allies to do the fighting on the ground while Americans targeted Abu Bakr al-Baghdadi’s forces from the air. Iraqi and Syrian Kurds signed up—but not together—while the Turks balked. After two years, the United States regards the Syrian Kurdish People’s Protection Units, or YPG, has an effective ally in the fight against the Islamic State. Here is the problem for the Turks: The Turkey-based Kurdistan Workers’ Party (PKK), a terrorist organization that has been waging a war on the Turkish state since the mid-1980s, stood up the YPG after the Syrian uprising became militarized, and the two groups remain closely associated. The Turks regard the YPG and the PKK to be essentially the same group. From where Ankara sits, the United States— Turkey’s NATO ally—is helping to create a terrorist state on its border that could link up with the predominantly Kurdish portions of Turkey’s southeast, which are now under assault from the Turkish military and police in response to PKK violence. For some reason, the Turkish leadership believes that the Israelis and their supporters can help in this area in the same way the Israelis pressed the Obama administration to lay off the Egyptians. It is not a coincidence that Erdogan met with leaders of the Jewish-American community twice this past spring. It is not at all clear that the Turks will get the kind of support from Israel’s supporters in the United States that they would like, but Israelis are masters of realpolitik and in the competition between Turks and Kurds, they will likely pick Ankara. For their part, the Israelis have gone from rendering their clothing over the breach with the Turks to lo maziz lanu (literally, “it doesn’t move us”). Gaza has been quiet, relations with Egypt have been quite good, ties with Saudi Arabia and the United Arab Emirates have developed, Cyprus and Greece are new partners, and the Turkish leadership has proved themselves over and over again to be nasty anti-Semites and anti-Zionists. The same could be said of the Egyptians, but Turkey is hardly Egypt, which is second only to the United States on Israel’s list of priorities. Still, the Israelis are getting something from this deal: Hamas is leaving Turkey (though as Jonathan Schanzer recently noted, there is reason to believe this may not actually happen), the Israelis do not have to lift the blockade of the Gaza Strip as the Turks have long demanded, and the Turks will be afforded a role in rebuilding Gaza, which some believe might bring stability to the area. The Israelis also get normal relations with Turkey, on Israel’s terms. I am not sure this is as big a deal as it is being made out to be. Sure, it ends a period of estrangement for two American allies in the Middle East, which is a good thing. Beyond that kind of generality, it is hard to discern how much will change now. In the past, analysts have touted the potential for intelligence and security cooperation, but that seems unlikely. The Turks fought tooth and nail to keep the Israelis away from NATO intelligence data, blew an Israeli spy ring in Istanbul, and have engaged in various kinds of gratuitous nastiness, including disinviting the Israelis to NATO exercises held on Turkish territory and refusing flight clearance for Israeli military transport aircraft en route to Poland for visits to Auschwitz by the Israel Defense Forces. Add to this Erdogan’s February 2013 declaration that “Zionism is a crime against humanity.” Taken together, the Israelis are likely satisfied with the agreement, but distrust and resentment remain. On the Turkish side, this agreement came together as a result of Ankara’s weakness, which cannot sit well with the Turkish leadership. When the headlines fade and after the ambassadors are exchanged, Israel-Turkey political and diplomatic ties will likely look a lot more like they do now than current expectations suggest and remain vulnerable to developments in the Gaza Strip, Cyprus, and Israel’s relations with Kurds across the region. In other words, it is no big deal.